Twelve years into this work and I still know next to nothing about roses! At left: 'Marianne' a Hybrid Gallica. Well, maybe that's an exaggeration, but some days it feels that way. *laughs* I mean, I know plenty about how certain traits follow Mendelian genetics in a fairly straightforward manner and how often they will manifest in a group of seedlings; miniaturism is a dominant, China-type remontancy is a recessive, etc. But what is happening in instances where two modern repeat-blooming hybrids are crossed and a large percentage of the offspring are once-blooming? How many genes control disease immunity, and how are they inherited? 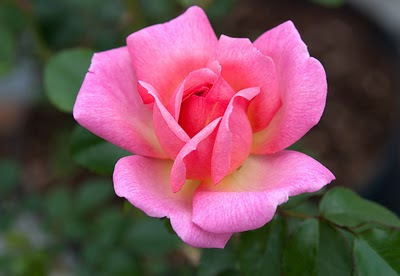 Does each species of rose have its own unique gene for Blackspot resistance, and if so, how do we tap into that set of genes to make the trait reliably transmissible for future generations? 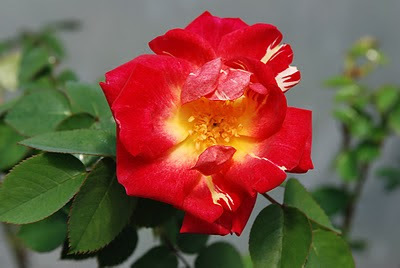 Surely its way past time that roses were freed of the disease problems that have plagued them for over 100 years!? Unfortunately its just not that simple. I can attest to the fact that any time you cross a completely disease free rose with a modern hybrid that has traits you want, you will lose most, if not all of the disease resistance so valued in the one. 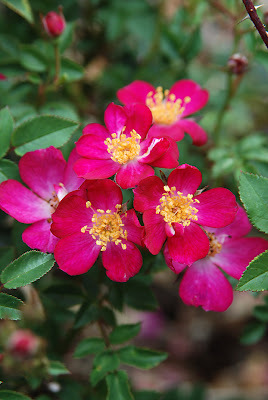 Certainly, people like Bill Radler have contributed significantly to improvements in this area, but many will agree that roses like 'Knockout', as valuable as they are as a landscape shrub, lack sophistication of bloom style. It is at this point that I begin to realize that some of the goals I have in mind are going to require many years to accomplish, if they are possible at all. 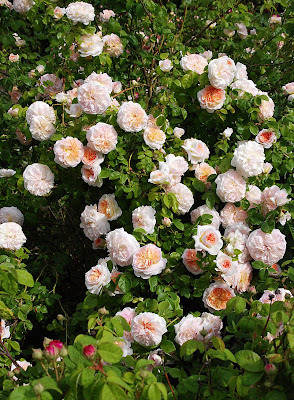 Robert Basye put many years of effort into breeding for Blackspot immunity and while he felt he had barely made a dent in the problem, some of his roses are remarkably free from disease. 'Commander Gillette' and 'Basye's Blueberry' are both very clean, easy to grow varieties that I am now using in my work. Both are very pleasing shrubs with virtue in a garden setting, by the way. Looking at what a temperamental lot our modern roses are, I can't help but think that many poor choices were made in their evolution. I mean, consider the whole exhibiting thing as it started in Europe with the Hybrid Perpetuals and early Hybrid Teas: the plants were inconsequential, it was the blooms that were important. (The "English Boxes" were the epitome of this nightmare, where all you did was lop the blooms off and display the beheaded flowers stuffed into holes arranged on the top of the box. Frankly, that is an ugly concept in my opinion.) So what we ended up with were a lot of early roses that were unmanageable in the garden without a lot of human intervention. Hybrid Perpetuals were manured like no tomorrow, pruned hard and fussed over just to get a second crop of blooms; hardly "perpetual"! 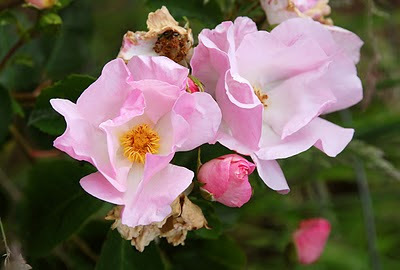 The early Hybrid Teas weren't much better except they inherited a more reliable repeat bloom habit from their Tea parents. They were still ungainly plants, many of them, with poor architecture that contributed little to the garden landscape. In fact, roses weren't considered part of the garden landscape at all: they were planted in designated beds in tidy rows, without competition, where their sole purpose was as bloom machines. 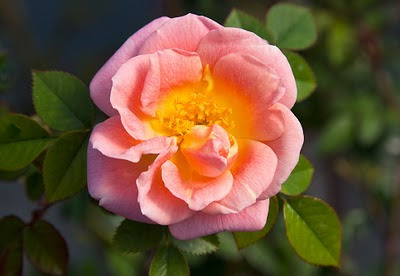 The whole idea of making roses for landscape integration was largely lost as Hybrid Teas evolved. And here we are today, still struggling to correct the problem. Ugh. There are no perfect roses, only visions of perfection. The visions lead us by the nose, tempting us to achieve, but when so many variables are involved, chances are once you cement one trait into place, fifteen others have been lost, and the cycle of adding and losing goes one for years, decades. Ralph Moore knew more about this than anyone. A hundred and two years wasn't enough time to get everything done that he wanted to. I'll be lucky to accomplish half of what he managed. So, off I go; there is a forty pound box of rose hips in the fridge that needs my attention. I've sown some seed already, but I've barely gotten started. With any luck, out of the 50,000 seeds I am sowing this year, I will find half a dozen plants that help me on the journey towards my perfect rose. This is a seedling from a cross of 'Yellow Charles Austin' and 'Out of Yesteryear'. It is by far the strongest yellow I have obtained from the 'Out of Yesteryear' breeding line. I used this in 2009 mostly as a pollen parent, obtaining a good amount of seed from the crosses attempted. All crosses using it as a seed parent failed and so I doubt this will ever set seed reliably (or at all). Like many of the full sized Hybrid Bracteatas, this has rather sprawling/arching canes, eventually making a kind of bowl shaped plant. I don't recall that it has a particularly good fragrance. Foliage is dark green, glossy and quite healthy. I have chosen this as a test breeder because of that rich yellow coloring, which it will hopefully pass on to its offspring. Getting deeply pigmented hybrids from the 'Out of Yesteryear' breeding line has been particularly difficult. Maybe this seedling will be a turning point? This is a seedling that was planted out in the garden in 2005 and subsequently forgotten about: I had planted it in a section where other roses hid it from view for a while. I rediscovered it in the corner last Spring, tucked behind other roses and growing like a weed in spite of the fact that its irrigation had failed at least a year ago. I immediately set it to work as a seed bearer, noting that it was completely free of disease. I hope it may prove useful in my search for new lines of Blackspot immune roses. 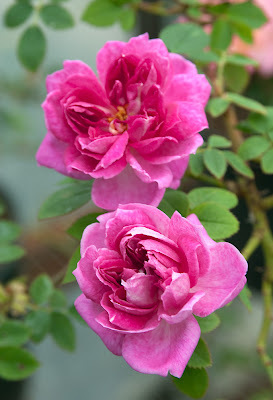 (R. wichurana is capable of breeding highly Blackspot resistant roses, we know that) Another trait R. wichurana often passes on to its progeny is ease of propagation by cuttings, and this seedling is no exception. I have a couple of band sized copies of this seedling which I am willing to share with other hybridizers. Contact me if you are seriously interested. 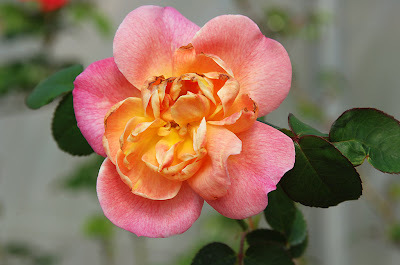 Janet Inada at Rogue Valley Roses is now offering a limited edition of one of my Floribunda selections from a few years back, called 'Pam's Choice'. A couple of years ago my sister Pam was visiting and I had placed a vase full of cut roses from the garden on the dining table in the breakfast nook. She was very taken by the Lavender one with the unusual tan center, and I said "If I ever decide to put that into commerce, I'll call it 'Pam's Choice', that sound good to you?" I've had this plant around since 2003 and have been watching it and judging it, and several people prompted me to propagate it, so last Summer I did. 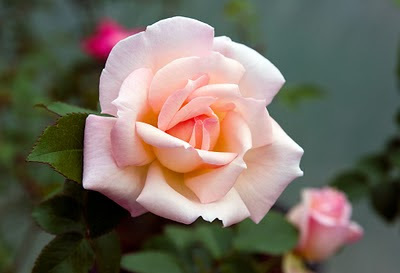 It is bred from the Ernest Williams mini 'Suntan Beauty' and the old Floribunda 'Lavender Pinochhio', both a blend of lavender and tan. 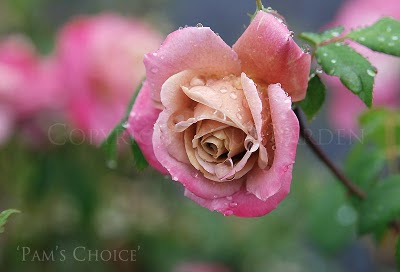 Unfortunately neither of the parents has much vigor, as is often the case with roses in this color range, but 'Pam's Choice' has significantly better vigor than either parent. It also blooms in great flushes, sometimes one to a stem, often in clusters. Sadly, it has no appreciable scent as far as I can tell. Note to hybridizers: 'Suntan Beauty' sets seed easily and the resulting seedlings are often odd muted colors in the lavender and brown range. I haven't used mine in several years but I plan to put it back into service in 2010. We recently had a week of unseasonably cold weather and this group of seedlings was kept in an unheated greenhouse and was subjected to the full extent of the cold snap. Night temps went as low as 8F and these containers, along with most of my collection, froze solid. I allowed this to happen in order to test the freeze survivability of these seedlings. I know, thats a harsh thing to do, but I felt it was necessary. Sadly, one of the prettiest of this four, 47-06-09 was killed by the freeze as far as I can tell. There is no live wood left on the plant and that does not bode well. Ah well, this is what must be done to find out who can tolerate freezes and who can't. Most rose growers in North America need Winter hardy plants for their modern gardens and I need to take that into consideration. Yet another seedling from this group. Larger foliage than some of the others, and the bloom was close to 2.5". Long arching canes to 5 feet so far, undoubtedly will get bigger. No pollen that I could find, and did not set seed. I doubt I will try to use it in breeding, as I dislike the muddled bloom form with the misshapen petaloids at the center. 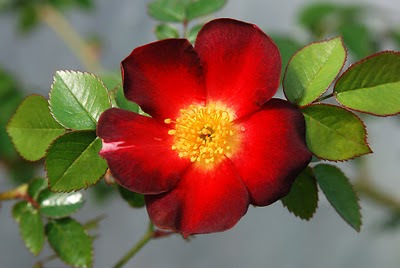 Karl King has formatted Ralph Moore's book "The Breeding and Development of Modern Moss Roses" as a PDF file for download. This should be of great interest to anyone considering the pursuit of breeding new hybrids in this style. 47-06-06: another 'Joycie' X Fortune's Yellow' seedling. Pictured here is 47-06-06, the sixth of this group of seedlings to bloom. Similar to the others from this batch it has arching growth to at least 6 feet, blooms once and doesn't set seed. Its pollen was tried on a few seed parents and one hip resulted from a cross with 'June Laver'. I will probably make more attempts to use it in breeding this coming Spring. 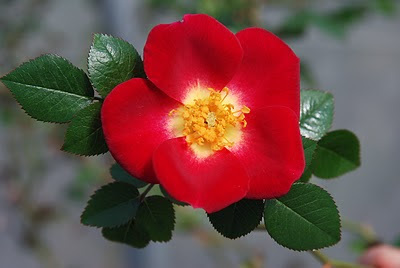 This was the reddest of the lot and curiously it has some white China-like streaks in some of the outer petals. This seedling is phototropic, darkening in color as it ages. No fragrance was detected. Ploidy: probably a triploid, considering its pedigree. This week I was sorting through my 2009 photo library and encountered a group of photos depicting seedlings from a 2006 cross of 'Joycie' X 'Fortune's Double Yellow'. For most of these seedlings, 2009 was their first flowering and I documented all of the dozen or so that had bloomed. I intended on writing about these ages ago, but had forgotten to do so! 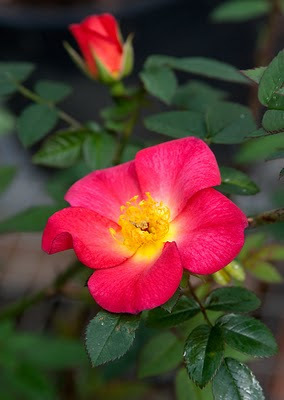 47-06-01, the seedling depicted here, was the first one to bloom, flowering for the first time in 2008. It was one of only two that bloomed in its second year and this photo illustrates its second year of blooming. As it happens, this is the only one out of 14 that shows strong yellow/orange coloring. The rest are pinks with various shadings of red or peach. (well, one is a clear pink and one is a lavender/pink) This bloom is about 1.5" in diameter, has no fragrance, lasts for several days and tends to deepen in color rather than fading with age. The photo is an accurate depiction: it is a deep yellow/orange with a dark rust colored overlay towards the outer petal edges. 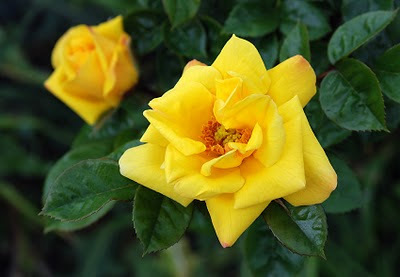 The idea here had been to introduce remontancy genes into the 'Fortune's Yellow' breeding, and to reduce the size of the plant by using 'Joycie', a miniature. It was hoped that some strong yellows would result, but that wasn't the case, except this one plant. None of these seedlings has shown any inclination to repeat, which may or may not happen with age. However, all of these seedlings should have one copy of the modern remontancy gene which can be passed on to the next generation, assuming there is some fertility moving forward. 47-06-01 is one of about four selections that I attempted to use in breeding in 2009. Not one of these four set seed (in fact none of this group of seedlings set open pollinated seed). However, pollen from this seedling (and one other, which I will describe soon) did result in a few seeds when placed on some of my more willing seed setters. We will see in a few months whether any of these seeds is viable or not. I will continue to use pollen from two seedlings from this cross in other crosses in 2010. In terms of plant habit and behavior, this seedling (and most of the others) is what you might describe as a "climbing miniature", with long arching canes that branch and bloom on the lateral branches. Most of these remain under 6 feet tall so far, but I get the impression that some of them will exceed that height by at least 2X. All but one have small, modern looking foliage. At this time, all are growing in containers in one greenhouse, and so I know little about disease resistance, except to say that they have all shown a marked resistance to Mildew when grown under glass. All of these are moderately thorny as well, and have proven to be quite deciduous, unlike 'Fortune's Yellow' which is inclined to hang on to its foliage. Stay tuned for more about the 47-06 group.